This study has 10 sessions, incorporating an introductory session and 9 lessons. 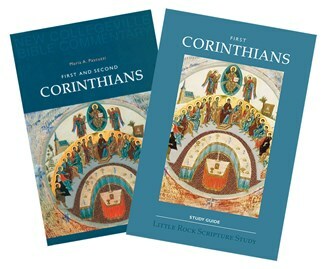 The Study Set includes the Study Guide by Little Rock Scripture Study Staff and the New Collegeville Bible Commentary, First and Second Corinthians, by Maria A. Pascuzzi (Liturgical Press). Note that the First Corinthians study and the Second Corinthians study use the same commentary. Those planning to do both studies should order Study Sets for one of the studies, and order only the study guide for the subsequent study. First Corinthians deals with divisions in the believing community at Corinth and the harm that they inflict on 'the body of Christ.' Paul also deals with many individual ethical problems in the community of which he has become aware through letters and contacts. Paul instructs the community concerning true wisdom; the sin of idolatry; the Lord's Supper; the role of God's ministers; the supreme importance of love; gifts of the Spirit; and the nature of the resurrection. The community of Corinth could easily be our own—struggling for unity in the midst of conflict, and discovering weaknesses and strengths. In this study, Paul invites you to find unity in the Gospel message.